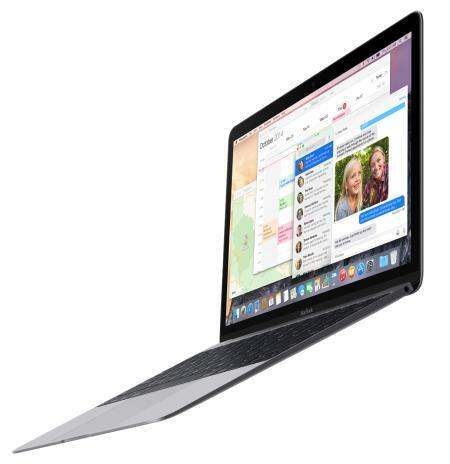 The refurbished Early 2015 Retina Space Gray Macbook is sleek and stunning! Its designed to make you productive everywhere you go. The used Space Gray Macbook is only 2 pounds, and just half an inch thick. You wont mind carrying it, and youll love showing it off. People will notice your Space Gray Macbook! When you open up your discount Space Gray Macbook and get to work, youll appreciate the bright, sharp Retina display with over 3 million pixels. The full size keyboard is a pleasure to type on, and the Force Touch trackpad provides a whole new dimension of control. Whether you are a business professional on the go, a student or the parent of a student that needs a powerful Mac laptop at an affordable price, this is the Macbook for you! And when you add in GainSavers unbeatable prices and 30 Day Money Back Guarantee, you cant go wrong with the refurbished Early 2015 Space Gray Macbook. The full size keyboard on the used Space Gray Macbook is unlike anything youve typed on before. To keep the Early 2015 Space Gray Macbook just a half an inch in thickness, the keyboard was completely redesigned. The Butterfly mechanism introduced in the Early 2015 Macbook keeps each key stable. Even when you press a key near the edge, the entire key moves downward evenly. The surface of the keys is also larger. Combined with the Butterfly mechanism, the keyboard provides a firm and consistent feelwith better control when typing. The Retina display on the used discount 12-inch Space Gray Macbook is truly brilliant. The Retina display has a resolution of 2304 x 1440, so you see amazing detail in all your photos and videos. The high resolution also give you a huge desktop, so you can keep multiple windows open at the same time, and have access to more icons and menus to get your work done faster. Each of the 3 million pixels on the screen of the used Space Gray Retina Macbook has a larger aperture. This allows 30% more light from the backlit LED screen to come through each pixel. The bright, clear images make for even more immersive movie viewing and game play, plus sharper, more readable text. The Force Touch trackpad on the Early 2015 used Space Gray Macbook gives you new gestures to use based on the amount of force you apply when pressing down on the trackpad. And it also provides a unique new experience  a trackpad that signals back. Haptic feedback in the Force Touch trackpad gives you a vibration you can feel in your fingertips. The vibrations give you a sense of responsiveness that confirms what you see and do on the screen. The fifth generation Intel Core M processor is the perfect match for the next generation Space Gary Macbook. It runs at 1.1GHz and has dual cores to manage multiple processing tasks simultaneously. The Intel Core M processor is a significant improvement inside the used Early 2015 Space Gray Macbook. It is designed to be extremely efficient in its use of power. The Core M processor draws less energy from the battery so you can get more work done when you are away from a power outlet. And it runs very cool. In fact, the Intel Core M processor is so cool that the Early 2015 Space Gray Macbook needs no internal fan. So not only does the used discount Macbook run fast, it runs silently. Use the GainSaver Configurator to select the options you want for your refurbished Space Gray Macbook. One popular option is to double the capabilities of your used Macbook by having GainSaver install Windows for you. With both the Mac OS and Windows on your Space Gray Macbook, its like two computers in one. Youll find that Macbook has all the power you need to run both operating systems, and you can install any of your favorite software programs for both Mac and PC. Click the Buy Now button when you have finished making your choices in the Configurator.